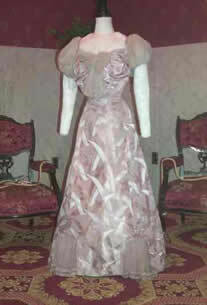 This exhibit examines the evolving role of First Ladies at the beginning of the twentieth century. The lives and legacies of First Ladies Edith Roosevelt, Helen Taft, Ellen Wilson, Edith Wilson, Florence Harding, Grace Coolidge and Lou Hoover are included. Among the items on display are the original diary of Florence Harding; gowns, hats and accessories worn by the Progressive Age First Ladies; and prints of paintings by Ellen Wilson. Tours, which begin at the Education and Research Center, are given Tuesday through Saturday at 9:30 and 10:30 a.m., and 12:30, 1:30 and 2:30 p.m. Admission price is $7 for adults, $6 for seniors 62 and up, and $5 for children under 18. By the beginning of 1901, the Victorian age came to a close. We now had machines that projected moving images and others that flew. The invention of the automobile ushered in a totally different world. Possibilities seemed to abound: including a growing role for women. This became evident in the changing role of the First Lady. With the young and energetic Edith Roosevelt, the role of the First Lady took on a totally different focus. The White House entered the Modern Age and, with it, the public would see the growing influence and public power of the First Lady. This would match and reflect the growth of the presidency and of the nation itself. Edith Kermit Carow Roosevelt, of an old New York family and Theodore Roosevelt’s second wife, was a quiet, intelligent, well read woman, who exerted great power over her husband, her family and her staff. She did it by a quiet word, a well-chosen phrase and an insight into whatever problem was at hand. Public morals, proper manners and a shrewd observation of how the world works were Edith Roosevelt’s ideals for a proper First Lady. She knew that the job had grown beyond the ability for one woman alone, so she decided to hire a social secretary, becoming the first First Lady to do so. For the first time the first lady’s schedule was as important as the president’s. Edith Roosevelt forbade the press to follow her five children. Her stepdaughter Alice was also part of the household. She hired photographer Frances Benjamin Johnston instead to take formal photographs of them, which she distributed to the press. She had the second floor of the White House closed to the public, thus ensuring privacy for the family. Mrs. Roosevelt hired architects McKim, Mead and White to renovate the White House. They renovated the front foyer of the White House, put in a grand staircase and refurbished the East Room, returning it to the look of the Federal Period. By the adding the East Wing and West Wing, Edith Roosevelt gave her large family more room on the second floor of the main building. Mrs. Roosevelt also created the First Ladies’ Gallery of portraits (adding her own portrait in 1902) and provided a permanent home for the pieces of past Presidential china. Mrs. Roosevelt kept a firm control over who was and was not invited to the White House. If a person’s morals offended her, they were not invited. Her husband’s overly enthusiastic manner and long-winded dinner speeches would come to a sudden halt by her tapping the table quietly. Edith Roosevelt’s successor, Helen Herron Taft, was very different from her predecessor. She probably wanted the job of First Lady more than anyone in White House history and brought with her unbounded ambition, ability and determination to succeed. As a result of acting as first lady of the Philippines for nearly four years, where her husband served as our first consul general, Helen Taft had experience running a large household and staff. Mrs. Taft approached her years in the White House with a vision: to bring it into the modern age. She got rid of the White House carriages and replaced them with a fleet of automobiles (she even drove herself around in her electric car). She believed in integration and thus promoted African Americans working in the White House to higher positions. She gave very formal and elegant dinners giving an imperial tone to the growing power of the nation. Soon after becoming First Lady, Nellie Taft played a major role in the evolution of Washington by creating “West Potomac Park”, a beautiful area running along the river, giving the city a place to hold concerts and for people to walk in the gardens. It was the first truly public project of a First Lady. In 1912, she planted the first of her famous cherry trees. She had received thousands of the cherry trees as a gift from the mayor of Tokyo. They became Helen Taft’s trademark. From the very start, Mrs. Taft was determined to make a difference. She insisted on accompanying her husband back to the White House after his inauguration in 1909, starting a tradition that continues today. Even though Nellie Taft lost a year of her First Ladyship due to a stroke in May of 1909, she made a full recovery. During her recovery her husband, the President, lovingly devoted part of every day helping her learn to talk. She also continued to plan state dinners, handling menus and arrangements with the courage of a woman determined to overcome her stroke disabilities. She made the role of political partner her top priority. She loved politics and being involved. Some historians have called her a co-president. Helen Taft enjoyed being First Lady and left the White House very reluctantly. Later in life she wrote a book that she called “Recollections of Full Years”. Ellen Axson Wilson, minister’s daughter, loving wife, mother and artist, took on the duties of the First Lady with some fear and uncertainty. However, once in the role, she became a most effective First Lady. Ellen Wilson helped the Women’s Civic Federation get women’s restrooms installed in the Post Office and Treasury Building. She succeeded in this effort by approaching Colonel House, her husband’s principle advisor, and convincing him to make the change. She also worked with the Women’s Civic Federation in touring the slums of the capital and fighting for passage of the “Alley Bill”. This bill would remove the unsightly buildings and improve the living conditions of the African-Americans living in the poorer sections of town. It was the first piece of legislation that a First Lady would influence. The artistic Ellen Wilson took an active interest in the folk art of the mountain people of the Appalachians, decorating with examples of their art, thus promoting a national interest in and bringing revenues to this very poor section of our country. She designed the Rose Garden, which today is one of the favorite spots on the White House grounds. Though her health was fragile, Mrs. Wilson took on a full load of duties and also served as a trusted sounding board for her husband’s ideas and policies. In addition, she continued to paint, particularly landscapes. She even found time to join an art colony in the summer of 1913 in Cornish, New Hampshire. Her fellow students included N. C. Wyeth and Maxfield Parrish. The weddings of Ellen’s daughters, along with a bad fall in March 1914, exhausted her. She also had Bright’s Disease, which further weakened her. Her last wish was to see the Alley Bill passed, which it was. She died on August 6, 1914 as World War I began in Europe. Shortly after Ellen’s death, Woodrow Wilson met the widow, Mrs. Norman Galt. Edith Bolling Galt was a blue eyed beauty, wealthy, fun loving and supportive woman. President Woodrow Wilson married Edith Galt on December 18, 1915 in her home in Washington DC. Edith Wilson proved to be as devoted a partner to her husband as Ellen had been. Edith soon became a close advisor to her husband. Other advisors to her husband who did not agree with her were soon removed from their positions. After a time, only Edith remained as her husband’s counselor. On April 3, 1917, the United States declared war on Germany. Edith Wilson threw herself whole-heartily into the war effort. She raised sheep on the south lawn of the White House to help the wool industry in the war effort; she limited the use of sugar, butter and coffee during war rationing; she worked in the canteens around the capital; and she helped the Red Cross. At a time when women were fighting for the right to vote, Edith Wilson remained steadfastly against the Suffrage Movement. When President Wilson arrested the suffragettes who were at the entrance to the White House, Edith insisted that they remain in jail until they repented and promised not to protest again. After the war ended, Edith accompanied the president to Europe and was at his side during the entire Paris Peace Conference. She listened in on special meetings and offered her husband advice. When he fought to get his League of Nations accepted by Congress and then by the American people, Edith never wavered and always consulted that he should not compromise. Following the President’s stroke, Edith enlisted the help of President Wilson’s physician, Dr. Cary Grayson, to hide the severity of Wilson’s condition, even from the Vice-President and the cabinet. It was Mrs. Wilson who determined what bills would be brought to her husband’s attention and who would be given orders. Not until years later did the American public learn that there had been a vacuum in the White House chain of command for nearly a year and a half. The three First Ladies who followed Edith Wilson – Florence Harding, Grace Coolidge and Lou Hoover - were activist women who had pursued careers, faced hardships and were full partners in their husbands’ careers. They advocated for a greater role for women in the world. A landmark event for women was the passing of the 19th Amendment, women’s right to vote, in August of 1920, which pleased all three First Ladies. Florence Kling Harding and Lou Henry Hoover were politically active women who took an interest in getting women more involved in voting and running for office. Florence Kling Harding, one of our oldest First Ladies, projected a youthful and active image. She opened the White House to everyone, saying, “It’s their house!” She encouraged press conferences, met regularly with reporters and actively sought out photographic opportunities. She advised her husband and kept lines of communications open with his cabinet. Mrs. Harding worked actively with women’s groups, advising women that it was not just enough to vote but more importantly to vote intelligently by studying the issues and the candidates. She worked on a variety of causes: the rights of World War I veterans, support of animal rights, the Armenian Relief Committee, desegregation, children’s rights and support of the immigrants. Florence Harding believed in unlimited potential for women in the world. Nineteen years younger than Mrs. Harding, Grace Goodhue Coolidge presented a totally different image: sweet, gentle, and humorous, and totally under the dominance of her husband. She was never allowed to publicly pursue any political interests and was never permitted to speak publicly except on social issues. Mrs. Coolidge appealed to the magazines of the period, and there were many articles written about her. Her mild manner was used to soften the hard, stern image presented by her husband, Calvin. She saw potential in the social aspects of the First Ladyship. Her youth and beauty made the Coolidge White House more approachable and appealing. Early in her life she pursued a interest in teaching the deaf at the Clarke School in Northampton, Massachusetts and she later worked to educate people on the plight of the deaf. One of her proudest moments in the White House was when she met Helen Keller. She, along with her husband, was able to use her position to raise 2 million dollars for the Clarke School for the Deaf. Her sympathy for the afflicted made her a good spokesperson for both Easter Seals and Christmas Seals, and children found in her a ready friend. She asked Congress to protect White House artifacts by declaring them national treasures that would remain in the possession of the White House. She continued an inventory of White House items. Lou Henry Hoover was a very different First Lady. She was widely traveled (she honeymooned in China during the Boxer Rebellion and learned to fire a pistol). She was well educated (she was the first woman in America to earn a geology degree, which she received from Stanford University). She could speak five languages, including Mandarin Chinese. She also was familiar with Washington society having been the wife of the Secretary of Commerce for eight years prior to becoming First Lady. Mrs. Hoover was an avid supporter of the Girl Scouts. A member of a number of organizations that promoted physical fitness, Lou Hoover saw the Girl Scouts as a way for girls to broaden their horizons as well as become physically fit. She was president of the Girl Scouts years before becoming the Honorary President as First Lady. She would advocate support for this organization for the rest of her life. Her first speeches on the radio were about Girl Scouts. Mrs. Hoover believed in the equality of the sexes but saw it in turns of being a wife, mother and home figure. Her receptions were lavish and her evening clothes beautiful. In an attempt to bolster support of American industries, she tried to make cotton popular for evening clothes. She supported her husband’s policies and was hurt by the criticism of him after the Crash of 1929. People often wrote to Lou Hoover, pleading for help or money. On many occasions, she sent money to help out. When people repaid her, she never cashed the checks. She continued to work on the inventory of White House items, started by Grace Coolidge and others, which would later be used by Jacqueline Kennedy in her restoration of the White House. The ladies of the White House from Edith Roosevelt to Lou Hoover made their views known, and gave their husbands their advice. They made inroads that would lay the groundwork for future First Ladies.